A place I put articles about my projects and interests. I'm lovin' my new ride a 2007 BMW 335i Coupe ("E92" internally to BMW) delivered May 24, 2007. I wanted to do European Delivery (for 2nd time), but didn't want to wait. Photos here. 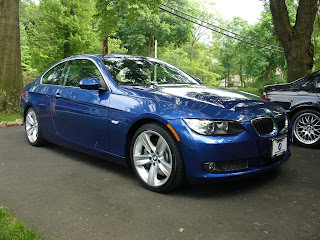 E90Post.com is a great website to discuss or learn about 3series BMW's. Check out my profile. For me, it has it all: potent acceleration, beauty, luxury, comfort, and handling. To top it off, it's a great value, all things considered. For those who will note the Infiniti G37: I'll accept the value proposition (full disclosure: I haven't driven it), but you get a lot of externalities with a BMW. Not to be a jerk, but prestige; the well developed enthusiast community with access to the track days, bulletin boards, etc; relatedly - the support of the owner community if you should decide to keep it for, say 10 years; the fact that it has an identity when its 5 or more years old, unlike say, the Lexus IS, which sort of fades away when it ages; the racing pedigree; the tradition; the option for Euro delivery. This is my third BMW, (the first was a 2001 325Ci, the second, my wife's CPO 2003 530i), and I can't see this trend ending. I really don't see an alternative for me. If I go upmarket, it will probably be for a 911 C2S (997), but that ride is double the price. The Canon HF10: the new standard in AVCHD codec Camcorders, but I'm buying the HV30! Well, I changed my mind. I bought the HF10 Why?